And now for something completely vapid: Chinese girl pop stars! I was bored, surfing around on Baidu, as I sometimes do, and I stumbled across this Baidu ranking of female pop stars. The ranking is assigned by searches, and each star is linked to photos, discussions, and “星闻” (a pun on 星 and 新闻, meaning “star news”). It even keeps track of changes in the rankings. I immediately noted two things about the list. First, I knew a whole lot fewer of the stars than I expected to. I mean, I don’t exactly immerse myself in Chinese pop culture, but I thought I would know most of the top ten. I found that I only knew four of them by name. Second, the list is quite different from the recent list of China’s 50 Most Beautiful People. This is to be expected; the lists had different standards, after all. Or, one actually had standards, I should say. But it’s interesting to compare anyway. 刘亦菲. I had seen this girl everywhere in advertising around Shanghai, and had no idea who she was. Apparently this 20-year-old is pretty popular these days (#1 on Baidu, anyway). She has a movie called 五月之恋 (“Love of May”) which you can watch in its entirety on YouTube (Chinese only). 蔡依林 is a Taiwanese pop star I’ve written about before. She’s managed to stay popular for quite a while. There are karaoke-style videos of hers on YouTube as well, such as the video for Love, Love, Love. (I hope you have a strong stomach if you’re thinking of clicking on that link.) 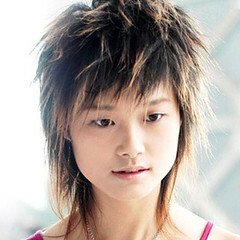 She was so much cooler when she was dating Jay Chou (周杰伦). 李宇春. Anyone living in China should know this face. She won the “Supergirl” singing contest last year. I’m not going to say anything bad about her ever again because her fans are crazy. They will crush me. You can find her on YouTube as well. S.H.E. #5 is a trick, because it’s actually three girls. (No one ever said Baidu was smart.) This is a girl band you’re likely to know if you’ve lived in China any length of time. They’re well known for that Superstar song, and currently annoying everyone on the Shanghai subway as their cutesy girl antics are played on the video screens ad nauseum. Surprise, surprise… there are tons of their videos on YouTube. 张娜拉. I have no idea who this girl is, but I did just enough research to discover that she’s Korean, her “real name” is Jang Nara, and she’s on YouTube. 林志玲, who goes by the crazy moniker of Lin Chih Ling in Taiwan, seems to be unable to wear a bikini and stand up, causing her to just roll around on the ground in a giddy delirium. Those so inclined can do more research on this intriguing woman on YouTube. 张含韵. I once posted a video of hers on ChinesePod without even knowing her name for sure. Now I know her name, but still find myself distinctly apathetic about the details of this young woman’s life. She is #8. Run along to YouTube, lads. If her video for “ai ya ya” is any indication, she wants to cute you to death. 林心如. This Taiwanese actress has been popular for a while, it seems. I know she’s been trying to steal my roommate’s heart back away from Zhang Ziyi for some time, anyway. You can find her on TubeYou, or whatever that site was called. 张韶涵 is our #10. Knowing absolutely nothing about this girl, I can still tell you two things: (1) she is annoying, and (2) she is on YouTube. 1. Zhang Ziyi, #4 on “Most Beautiful” is #36 on Baidu’s list. OK, so Chinese guys like her a lot less than American guys, but they don’t hate her (unless maybe their girlfriends are around). 4. Liu Yifei, #1 on Baidu’s list, placed 13 on the “Most Beautiful” list. 5. Lin Zhiling, Baidu’s #7, is #26 on the “Most Beautiful” list. 6. Shu Qi is #15 on the “Most Beautiful” list and #21 on Baidu’s list. 7. Wang Fei (Faye Wong) is #18 on both lists. 8. Zhang Baizhi (Cecilia Cheung), always popular, placed #13 on Baidu and #25 on the other. I could go on and find some more overlap, but there’s not much point. A handful of stars aside, the lists are significantly different. It’s almost as if the young male crowd thronging to China’s internet cafes and using Baidu prefers young, pretty girls, regardless of talent! Should I admit that I recognize all those people on sight? Probably not. Interesting that the first western star on the girls’ list is Britney at #26, while David Beckham comes in at #9 on the boys‘ (link provided for parity). For further research, this year’s list of 50 most beautiful people is slightly different from last year’s, but it’s not really any closer to the Baidu rankings. seems not an easy job to make all the hyperlinks for all the actress’s names. Good job!And Great Post! None of them is good though! I only recognized 2, 5, 7, and 10. I think #10 does promotions for McDonalds, btw. Also, 蔡依林 is a far cry from what I’d consider beautiful. I have no idea what her secret is, but somehow she’s mesmorized one set of nine year olds after another. interesting how 1, 2, 5, 7, and 9 are all Taiwanese. interesting as always! Wanted to mention that the link to your entry about 蔡依林 points to nothing, it seems. I only recognize Lin Chih Ling, and that’s cuz I took a trip to Singapore about a year ago. The other girls are alright to pretty, but Lin is truly gorgeous. 张韶涵 is a Chinese Canadian. 刘亦菲 is a Chinese American. Jang Nara is partly responsible for the annoying “kidult” craze in the last couple of years. But then again, I can say that about most Korean stars. They do have one thing in common: they’re all annoying! I know 2,3,5,6,9 and 10. I really like Chinese music so I should know a few. I watched a lot of no 6′ korean tv series. I like her. She usually plays a sort of tough girl with a delicate heart. But Jolin, SHE and Zhang shao han all have alot of good songs. They are nice to look at too. But Im at home in Ireland at the moment so when I get back to china at the end of June Im sure there will be a hell of a lot of new faces. I’ll say it, 李宇春 is ugly and she can’t sing, 张靓颖 was robbed! The girl who is number-one on the list — Liu Yi-Fei (刘亦菲) — is actually 18-year-old, and she has just completed her undergraduate study at Beijing Film Academy. (She started her freshman year at college when she was 15.) She is coming to the US in September, 2006, to begin her graduate study at Stanford University. 章子怡’s likeable enough, but a bit boring.But many star are boring.anyway, I respect her for her diligence. don’t believe baidu man! almost all of them listed there are the ones i hate the most… it’s not that i’m jealous or anything… and i do believe that they are the most hated chinese stars nowadays…..
they’re famous indeed, but not in a gd way.. especially those “chinese-idol” stars…they’re disgusting… li yu chun has no talent at all, neither does she hv a pretty face. oops, i shouldn’t hv used “she”…a “he” would be better. and zhang han yun can sick ppl to death…. i do like zhang shao han…..she’s pretty sweet and she is such a gifted singer for god’s sake! well. they are the most famous women,famous for both scandals and the good deeds, in China, but NOT the mot beautiful ones. you can’t deny the diversity there. these girls are not the best in China.I think the normal girls are better. oh, mine! I only know #1 刘亦菲. as I watched the TV Series “天龙八部”, everyone else on your list is stranger to me. call it culture difference, Zhang ManYu or Ziyi Zhang are not the beauty Chinese would consider. Although you may search lots of pretty stars on Baidu,but I must tell you that most of the Chinese do not appericiate that,actually they just take it as entertainment.As far as I’m concerned,this phenomenom is common all over the world. So I really don’t agree with you!If you want to find talented stars,you should know more about Chinese to get a proper approach! Some reports on the English journey is really unreliable! By the way,TangJiali is not popular in China at all! I must tick out a mistake : “ai ya ya ” is singed by Wang Rong who is a Hk singer.